7 Comments	Almost there, ready for the summit push! At 5am I left (with 8 others) Advance Base Camp to go to Camp 1. Hopefully the 4 other members of the group will follow one day after us. We arrived there at 11 and are now at 5300m. The hard wind is common but today was something else. Some empty tents were blown away down the slope and one actually came back up! Despite the hard wind it was really hot today, blue sky and a lot of sun. Tomorrow we are off to Camp 2 at 6100m. Today we had a rest day in Base Camp. We visited the Kyrgyzstan mountain festival. There were supposed to be awesome horse races but after yet another speech our priorities moved to shaslick bread and tea. 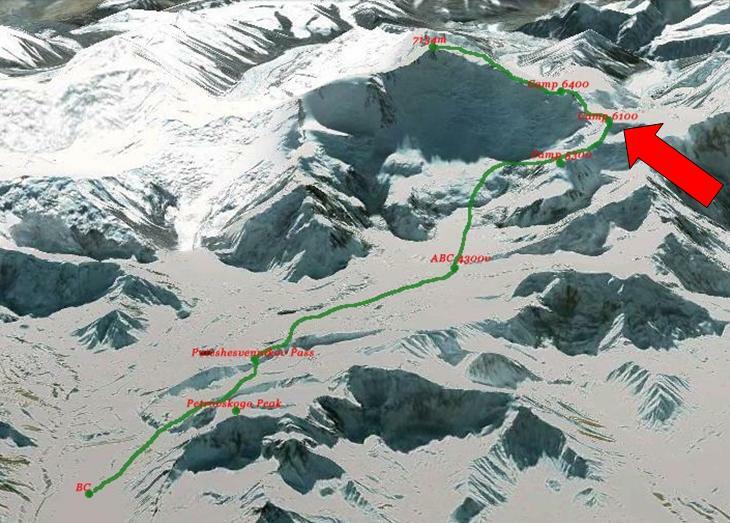 Tomorrow we will go up to Advance Base Camp where Thijmen will start his summit attempt! 13:30h. We just arrived at camp 2! With strong winds and a minus twenty wind chill equivalent temperature, we won’t stay here for long. We also reached the summit of Razdelnaya (6190m) which was just around the corner. Now back down to camp 1 and sleep. 1 Comment	New height record!